Walk with us through the area known as Punta Uvita in Ballena Marine Park. Here you will see a variety of wildlife including shore birds & mammals but also a great vegetation that includes a mangroves forest but also here is where is located the famous ; Tombolo, locally known as the Whale’s Tail, which is a famous natural barrier reef that was created by the forces of two rivers on either side of the reef, which due to the currents has formed and maintained the shape of a whale’s tail when viewed from above. The walk begins at our operation center walking a mile trough the town of Bahia and on the way to the beach our guide will show you part of our town and some historical vestiges that includes the oldest house of Bahia. 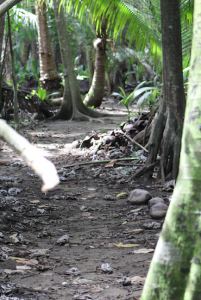 Then at the entrance to Uvita beach will start the walk at the trail after crossing a creek . 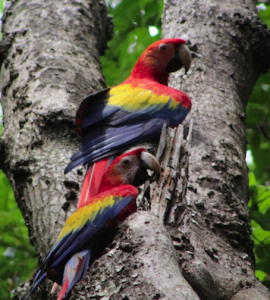 Along the trail there is a chance of seeing howler monkeys, white-faced monkeys, sloths, bats, raccoons, birds including the red scarlet macaw and more wildlife . Plants and trees that includes the wonderful Mangrove tree are also part of the trail as you venture on a 2.5-3 hour walk. A short walk on the beach on the way back is part of the adventure and you can even see the famous whale’s Tail. RATE : Adults $55 USD / Children $35 USD (under 10 years old) Book Now !! Note: Tour available only at low tide . Check with us the availability and best time to do the hike.